Sound Off: What are your hopes, dreams and wishes for today’s event? In less than three hours, the fun begins. 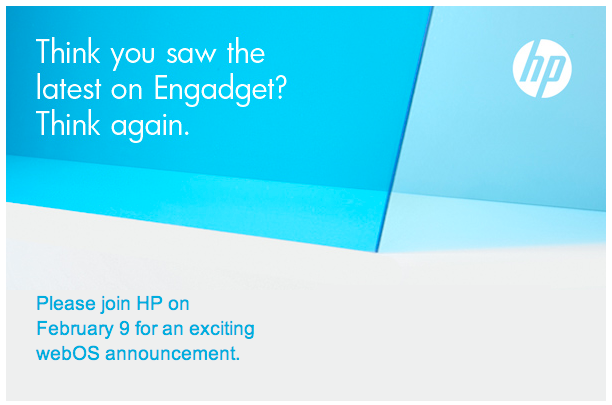 HP|Palm is set to unveil “the future” at their Think Big. Think Small. Think Beyond event. By now it’s pretty much a given that we’ll see one or more tablets and we’re surmising some new phone. Our hope is that we’ll see some shipping dates attached to the new products announced today, in addition to a wide array of carrier support. What are you hopes, dreams and wishes for today’s event? Have a prediction or two or three. Let us know in the comments. Our thoughts, Palm needs a superphone. All I want is a new, decent webOS phone on Sprint. That’s it. I’m pretty much just hoping for webOS 2 on my Sprint Pre. Anything more than that I could not care any less, but if they manage to wow me with a tablet that knocks the socks off the Android one or the iPad, then maybe I’ll pay attention. Announcing the imminent release of webOS 2.0 for all devices (including AT&T) would be nice. I agree with Speedy on this. Sprint users have been on the short end of the stick since summer 2009. Don’t just make it a side-grade with the Pre 2. Give us a next-generation WebOS phone to kick the Galaxy/iPhone devices in their bluetooths. A tablet would be lovely too, but for me, in order to keep my loyalty? An awesome WebOS phone for Sprint. And it has to come to market next month. No more “announce now, wait five months for the announcement to crush existing sales, then come up with something else”. agree, if they don’t come out with a next-gen device to compete, and some aggressive strategy to bring the app market to a similar level as the others, then I have no choice but to jump to another device. i put my faith in palm with the sprint pre and have been watching other users get the best technology for 2 years, while my phone becomes more and more outdated. Heck, I’d be happy if we get any WebOS phone with a decent (read auto-focus) camera. And even more happy if it was on Sprint. No doubt about it, Sprint’s been the dog end of webOS for quite some time. I was underwhelmed by the Pre 2 and don’t really mind that it wasn’t released on Sprint. I wouldn’t call it Pre 2, really, more like Pre 1.5. Depending on the price, a tablet could be nice. I’ll not buy one if it must be tied to a data service from any of the cell carriers. But if it’s a nice device and I can use it over wifi only, I’ll consider it. That price better be reasonable, though.